Like so many other tools, the air compressor has been more useful than first thought. Buying my brad nailer meant I needed something to power it, hence the compressor that I brought home with it. I had the foresight to also buy an air gun, extra hose and a tire inflation chuck for the riding mower. Having the ability to apply compressed air comes in very handy in a wood working shop. Aside from the obvious ease of blowing sawdust from the cracks and crevices of soon-to-be-finished projects, the compressor has proven to have other equally valuable uses. Sawdust not only gets all over everything in the shop, it gets IN everything as well. Virtually all of your power tools, electric or air powered, will live longer, function cooler, and operate more efficiently if you blow the sawdust out of their innards occasionally. Some woodworkers also like to use air-powered spray equipment for applying various finishes, making a compressor essential. 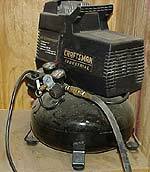 The good thing about most woodworking uses is you do not need a large capacity compressor. However, if you anticipate spraying finishes with any frequency, be sure to check into the air requirements of that kind of equipment before buying a compressor. This pancake model works fine for powering nail guns and blowing dust around, but probably lacks the capacity required for spraying finishes or paints. Even when attaching spray equipment to your compressor, most woodworking hobbyists will not require a large, professional type compressor that comes with an equally professional price tag. A decent compressor, with the appropriate capacity, can usually be found in the local home improvement centers at a reasonable cost. UPDATE: I have had this compressor for a couple of years now and am happy to report it has not missed a lick. I use it to power my brad and finish nailers, and for blowing sawdust out of my power tools. I had not had to do anything but leave it plugged and drain the tank a few times just to be sure it was not building up water. No water has been discovered.